Zalgiris Kaunas rallied late to beat Stelmet Zielona Gora 62-66 in an exciting clash on Friday in Group C. The Polish champs seemed on course for an impressive victory when they took a double-digit lead late in the third quarter, but Paulius Jankunas, Olivier Hanlan and Brock Motum played big roles in leading a fourth-quarter comeback. 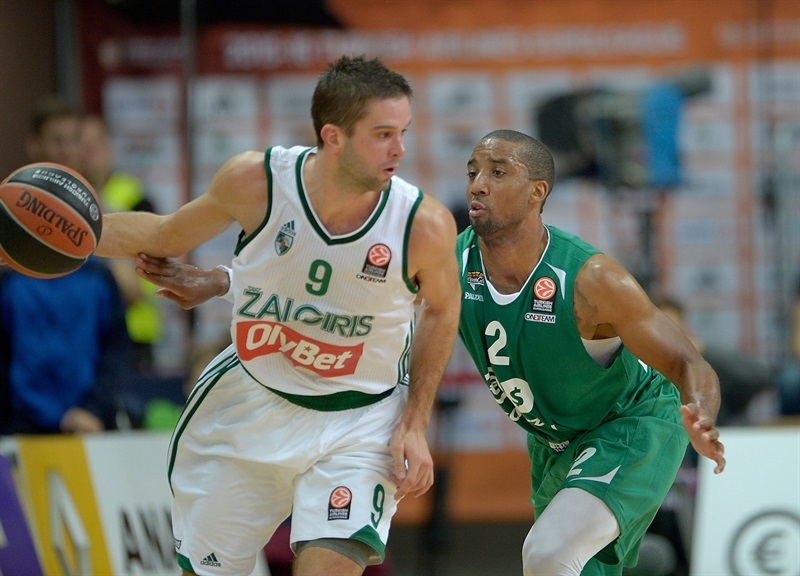 Over the final six minutes of the game, Zalgiris outscored Zielona Gora 2-12 to storm to victory. Motum’s put-back slam with 1:10 was the go-ahead bucket and Renaldas Seibutis iced the win from the line. Jaunkunas finished with 17 points, 11 rebounds and 2 blocks, while debutants Motum and Hanlan registered 16 and 14 points, respectively. Seibutis added 11 for the winners. 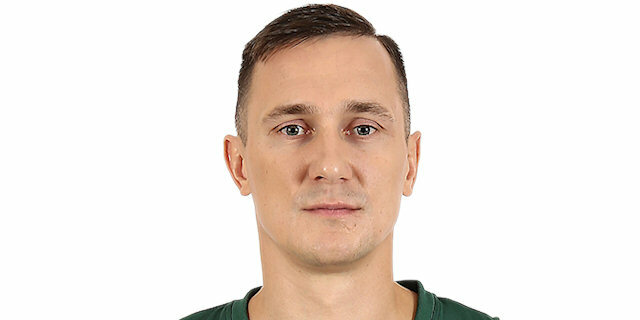 Vlad Moldoveanu paced Zielona Gora with 16 points on 3-of-4 three-point shooting and Lukasz Koszarek added 14 in defeat. Moldoveanu opened the scoring for the hosts with a three from the wing. Ian Vougioukas scored Zalgiris’s maiden basket. Koszarek heated up with a pair of jumpers for a 7-2 lead. Jankunas got a shooter’s roll on a jumper to trim the deficit. Jankunas heated up with a jumper and a layup of a fine Mantas Kalnietis assists, though Moldoveanu scored on the offensive glass in between. 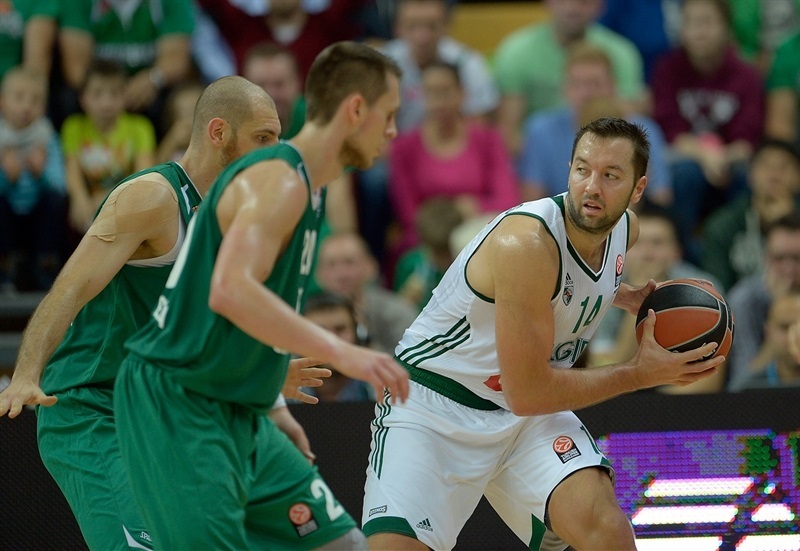 Seibutis’s basket on the break gave Zalgiris its first lead, 9-10. Dejan Borovnjak countered with a jumper and Mateusz Ponitka added a pair of free throws to put the hosts up 13-10. Borovnjak padded the Zielona Gora cushion with an offensive rebound and 2 free throws. Dee Bost made it a 5-point lead when he split free throws, but Motum assisted to Robertas Javtokas in the paint at the other end. Hanlan penetrated for a layup in the closing seconds of the quarter to bring the visitors within 17-15 after 10 minutes. Bost took a steal to the hoop, but was stopped by Hanlan with a hard foul. Bost split the free throws and Nemanja Djurusic followed the miss in to make it 20-15. Zalgiris came right back with a triple by Motum and Javtokas layup to tie it. Hanlan put the visitors ahead with a basket-plus-foul on the fast break. 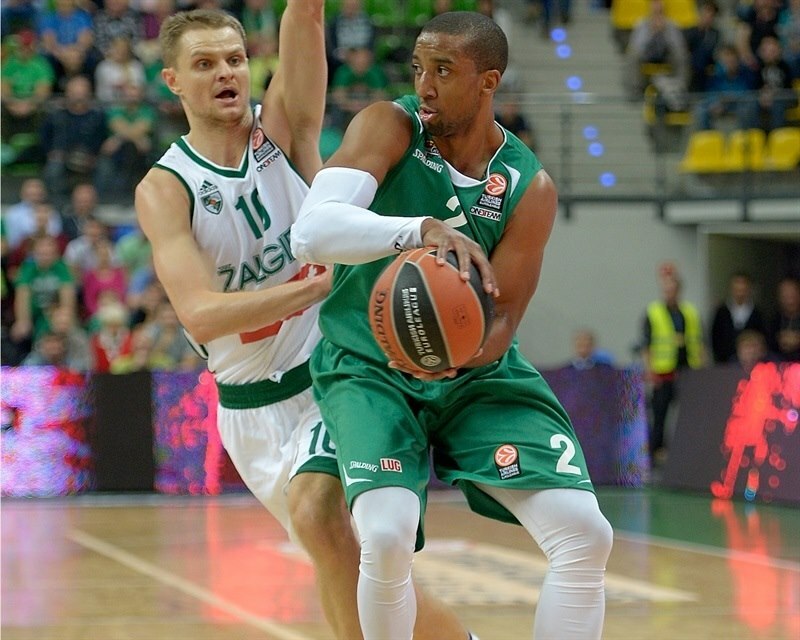 J.R. Reynolds converted a tough layup at the other end, but a three by Hanlan put Zalgiris up 22-26. Neither team scored for more than three minutes until Seibutis netted 2 free throws. Ponitka posted up Seibutis for a three-point play and then took a steal for a slam to trim the deficit to 1. Free throws by Jankunas kept Zalgiris ahead, 27-30, until Koszarek’s triple tied it with two minutes left in the half. Jankunas scored again inside to put the visitors back up. After Moldoveanu split free throws, Adam Hrycaniuk tipped in the miss to put Zielona Gora up by 1. The lead changed hands again on a Motum layup, but Karol Gruszecki’s drive and last-second layup made it 35-34 at the break. 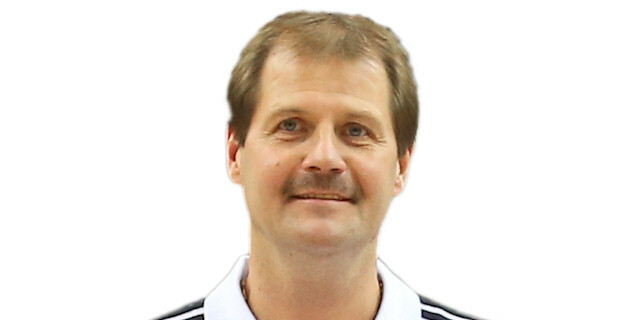 Just like at the start of the game, Moldoveanu opened the scoring with a three-pointer. Borovnjak free throws gave the hosts a 6-point edge. 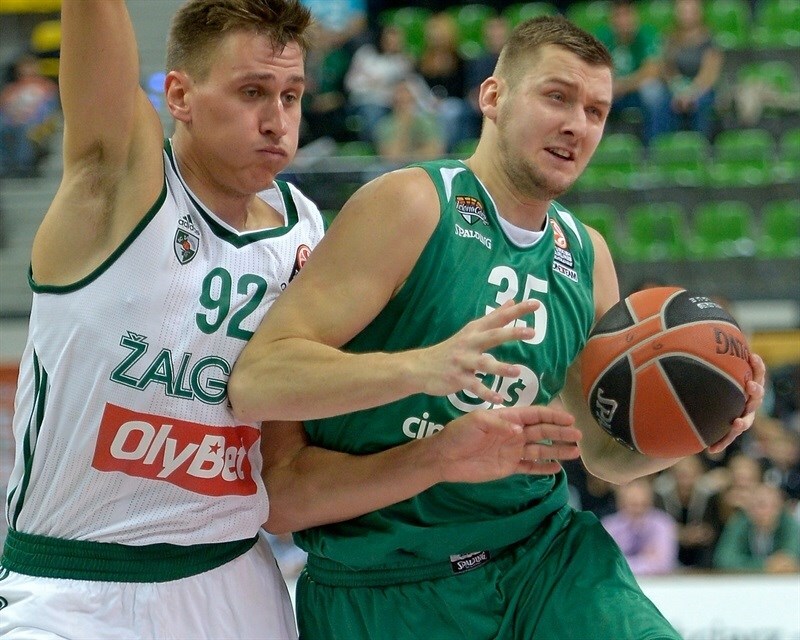 Motum halved Zalgiris’s deficit with a triple. Reynolds came up with a great defensive play to save a layup after Vougioukas had stolen the ball. Then Moldoveanu added points from the line to make it 42-37 midway through the quarter. Seibutis kept the visitors close from the line, but Ponitka shined when he drove, missed a layup, but grabbed his own rebound and put it in. Motum added free throws, but the momentum was now with the hosts. Koszarek and Bost drilled back-to-back threes – the second coming from deep at the end of the shot clock – for a 52-41 Zielona Gora advantage. Javtokas split free throws and later Kalnietis’s bounce pass left Motum in perfect position for a laup. Jankunas further trimmed the deficit to 53-46 with a pair of free throws to end the quarter. Jankunas hit a long jumper and then split free throws to rally Zalgiris within 4. However Moldoveanu responded from downtown. And then he scored again to make it 58-49. 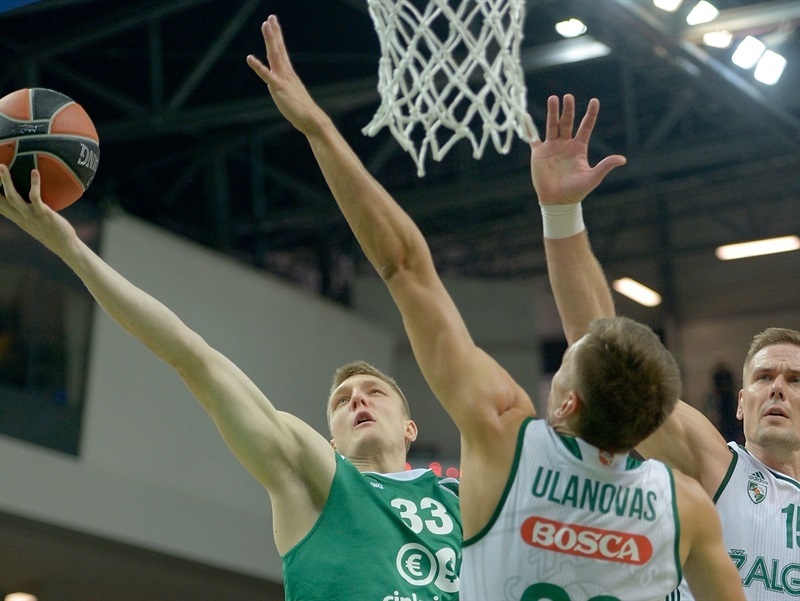 Zalgiris continued to fight as Hanlan drilled a three and Motum scored in the paint. Reynolds pushed the Zielona Gora lead back to 6, but Jankunas banked in a shot to make it 60-56. Koszarek pulled up for a tough jumper, but a three by Seibutis made it a one-possession game. And then Hanlan found himself open for a triple to tie the game at 62-62 with less than four minutes to go. More than two minutes passed before Motum soared to dunk in Jankunas’s missed shot with 1:10 to play. Ponitka missed twice from the line with a chance to tie it. Offensive rebounds by Jankunas and Javtokas helped Zalgiris kill the clock and Seibutis free throws made it 62-66 with seconds 17 remaining. 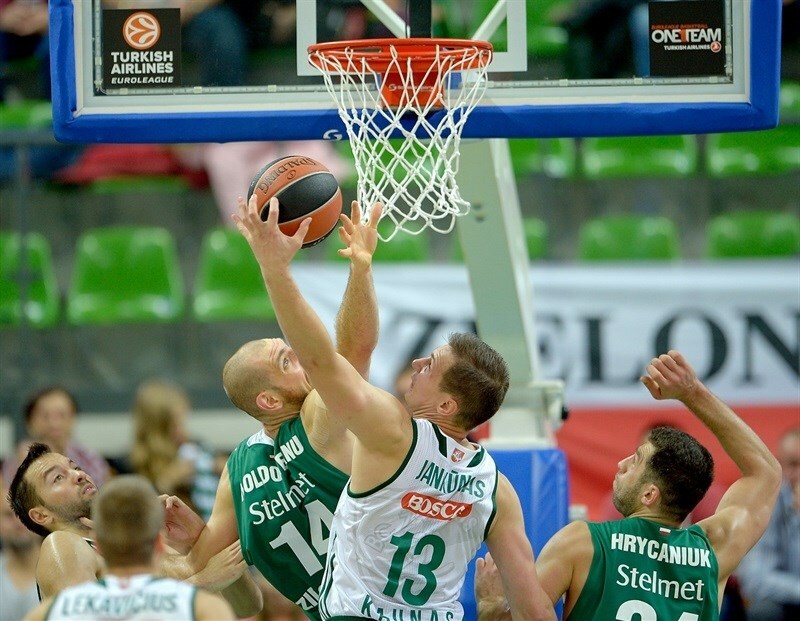 Zielona Gora was unable to score again and Zalgiris raced home with the tough win. 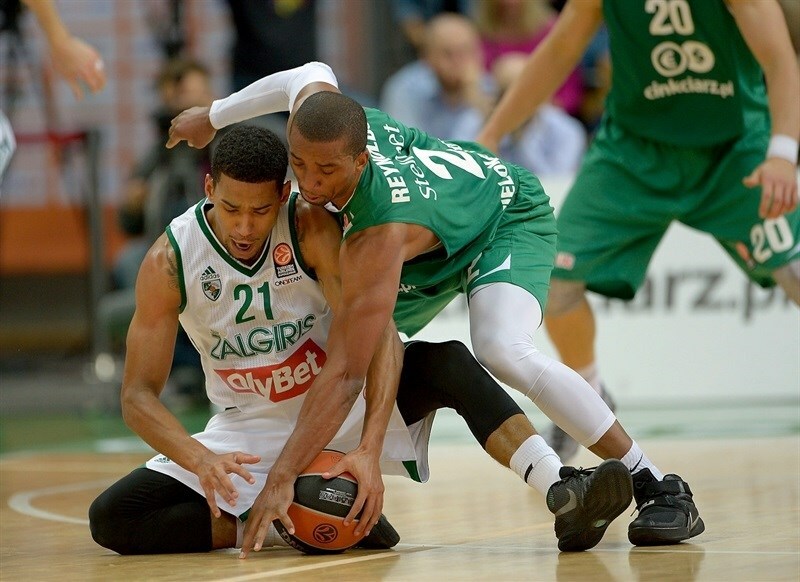 "Congratulations to Zalgiris. We won three quarters in this game, but basketball games have four. We lost our concentration in the last minutes. We made mistakes and missed free throws. " 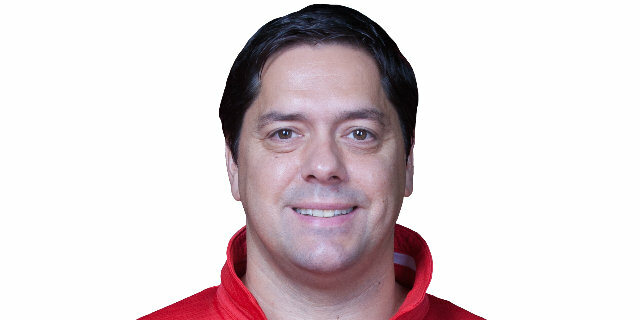 "Congratulations to Saso Filipovski and his team. It was a great game. Stelmet won three quarters, but we was better in the fourth. We kept more concentration and focus in the last minutes of the game. We came back to the game and won. Thank you to my players." "I do my job on the court. We are team, team it’s not only Vlad Moldoveanu. We ran out of luck, it’s sad. 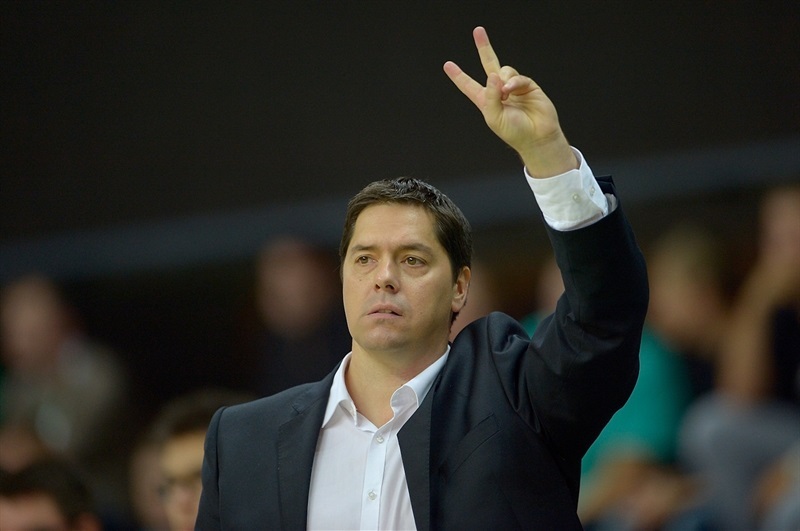 Congratulations to Zalgiris, it’s a great team. We must back to the gym, hard work and win next match. I want to say a thank you to the fans for their support." "It was great game for the fans. Very exciting to the last seconds. We came back to the game in the fourth quarter. We kept our concentration to the end and won this game. Congratulations to Stelmet. Stelmet is a great team."